My name is Jeanne Russell and my purpose is to spread love, healing, and spiritual growth by bringing my clients & students closer to God/creator/source in the way that best fits their set of beliefs. I believe that the search for happiness is part of human nature. It is achievable especially if we listen to our inner voice which is constantly whispering what is really important in our personal journey. This voice becomes louder and clearer once we decide to take care of ourselves in all senses, from within. Then, Inner Peace, Happiness and a constant state of Grace becomes a natural presence in our life. Constant inner peace is something you achieve only if you take care of all levels of your being; emotional, physical, mental and spiritual. I am not a doctor or medical professional. There is no specific religious affiliation used by me or needed by you, although I am very connected to God, the Ascended Masters, Archangels and the Angelic realm, so you will hear me referring to them. 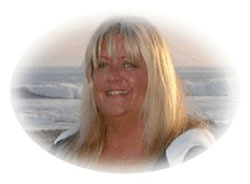 I am also a Certified Advanced Angel Practitioner through Charles Virtue's & Certified Angel Card Reader™ through Doreen Virtue's courses and Certified Medium through Doreen Virtue and Charles Virtue's course. I am also a Level 4 Lightwave Energy Practitioner, Melchizedek Method Practitioner and Channeler. As an AACP and Spiritual Intuitive Coach, I can speak with your Angels, your spirit guides and deceased loved ones to relay any messages they may have to help you along your life path. I teach all levels of Usui Reiki as well as Karuna® Reiki, Certified Mediumship Classes, Certified Crystal Classes, Certified Angel Classes, Channeling Classes, Telepathic Communication Courses. I am able to offer distant Reiki healings, Angel Card Readings, Spiritual Counseling and Mediumship Readings via telephone from all over the world. Clearing the chakras to be centered and balanced, clearing of the whole energy system. Reduces chemotherapy symptoms in cancer patients. and lots more.......I do not heal anyone, I am only the channel; the healing is up to the client and God. I am truly only an instrument in God's Divine Hands. I also have a large amount of Crystal's for sale at my Reiki location located in the Phoenix Arizona area please call to come in and look around. If you would like to be added to my Contact List to receive monthly Newsletters for upcoming classes and events, please e-mail me with your e-mail address at AngelsTouchReiki@aol.com or call (661) 510-3462.